Be quick and make this move-in ready home yours by spring! 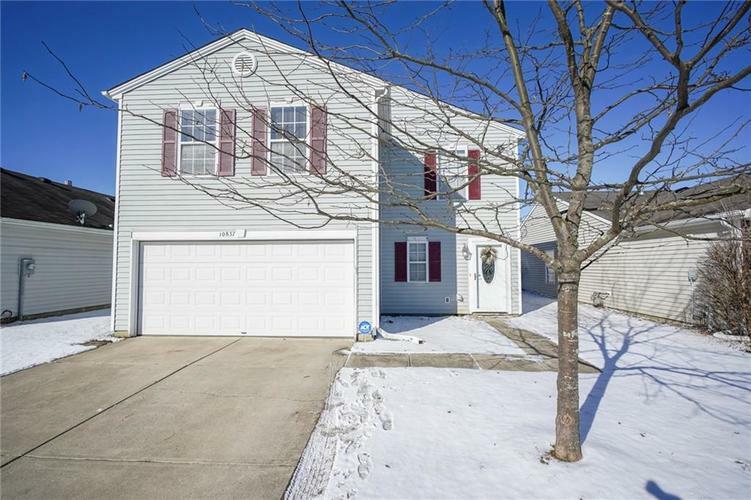 Nicely updated & clean, this 2 story home in Prairie Hollow has 3 large bedrooms, 2 full baths upstairs & one half bath on main level with laundry room conveniently located on second floor. The master bedroom has an enormous walk in closet and private bath w/ oversize tub/shower combo. Kitchen w/ tile flooring, a generous size pantry and includes the refrigerator, gas oven/range, and dishwasher. The family room and kitchen are open concept and provide space to host gatherings w/easy access to back concrete patio for outdoor fun. New Furnace & AC unit in 2017, New water heater in 2015 & new refrigerator in 2016. 1 year home warranty coverage & ADT security system equipment included. Directions:SR 67 to Ingalls, enter Prairie Hollow subdivision on Woods Drive. Left on Wymm Lane, Right on August Drive to 10837 August Drive on right.